Magnetic powder clutch selection and torque adjustment - Technology News - Dongguan Taiji Speed Reducer Clutch Co.,Ltd. Magnetic powder clutch is a component used in many equipment to adjust the running state of equipment. It is widely used in a series of mechanical equipment such as printing machine and packaging machine. In order to ensure the normal operation of these precision equipment, it is necessary to adjust the torque of the magnetic powder clutch to adjust the equipment. Operating status. However, for a user who has just contacted the magnetic powder clutch, if the clutch torque adjustment method cannot be accurately grasped, the device cannot be operated according to an accurate instruction, and the expected work effect cannot be achieved. The torque generated by the magnetic powder clutch during operation mainly utilizes the characteristics of the magnetic powder. When the current is turned on, the stable torque can be generated. The relationship between the excitation current and the transmitted torque is mainly linear, so the magnetic powder clutch is required. 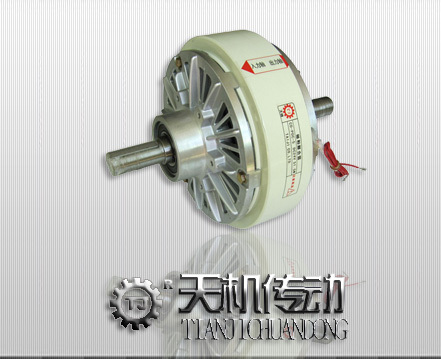 The torque adjustment changes according to its own intention, as long as the magnitude of the excitation current is changed, so that the torque of the magnetic powder clutch can be conveniently adjusted. When the magnetic coil is not conducting, the torque is not transmitted from the transmission shaft to the driven shaft. However, if the coil is electromagnetically energized, the magnetic powder is attracted by the magnetic force to cause hardening, and the torque is transmitted between the continuous sliding.Use the same magnetic powder clutch on the connecting device. For the purpose that no further adjustment is required after setting the torque, the following simple power supply device can be used. The rated voltage of the magnetic powder clutch is selected as DC24V. 4. Variable resistance The value of the resistor. V: Voltage regulator output voltage; Rated power.